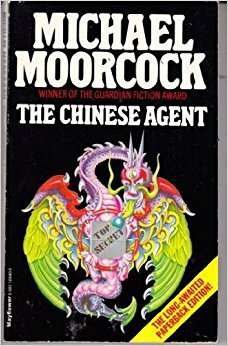 This entry was posted in Books, Forgotten Book and tagged Bill Barclay, Elric, Forgotten book, Jerry Cornelius, Michael Moorcock, Somewhere in the Night, Spy thrillers, Stealer of Souls, Stormbringer, The Chinese Agent by sanford. Bookmark the permalink. Congratulations! I have No sense how many FFBs I’ve written at this point. Discovering how many is an achievable goal, however. You should probably mention how Jerry Cornelius is a polymorphic character (of sorts! a panoply of characters) in Moorcock fiction (and fiction written by others with MM’s approval)…the rewrite clearly adds Cornell to the gallery. And I’m hosting this week…poking along in my elephantine (giant sloth-like?) fashion…Patti likely back next week! Congratulations on your #200 FFB! I enjoyed the early Michael Moorcock–Elric, Dorian Hawkmoon, etc.–and I still have those great LANCER editions.